More people than ever are realizing that bread isn’t supposed to make a person bloated and sick and perhaps they have a sensitivity to gluten. Or worse, they’re allergic. The Nima from 6SensorLabs could change the lives of these people and not just those with a gluten allergy. “Mason, I just want to know what Cheez-its taste like,” my daughter told my son a few months back. It was just a musing of a six-year old, but the comment breaks my heart. She was diagnosed with Celiac when she was 14-months old after a series of tests trying to determine why she was critically under-developed. Now she’s a healthy six year old, but like many others, struggles with food on a daily basis because she’s allergic to gluten. Most people with allergies are pretty good at identifying risky items. The Nima is designed to be an extra safeguard for questionable times (are those french fries gluten free? ), instead of something a person would use for every meal. The Nima takes two minutes to identify if there’s gluten in food. This is done using an antibody-based test that the founders say produce results on par with what’s done in labs. The device uses disposable pods that breaks down a sample of a food item. Each pod costs $3.99 and the device will retail for $249. The pods will be sold in packs of on a monthly basis. The pods can be configured to test for other allergies, additives and pathogens. Peanut and dairy pods are already in development. After the Nima determines the results of the test, the data is uploaded to a database the company is building that could be added to discovery apps like Yelp or Foursquare. 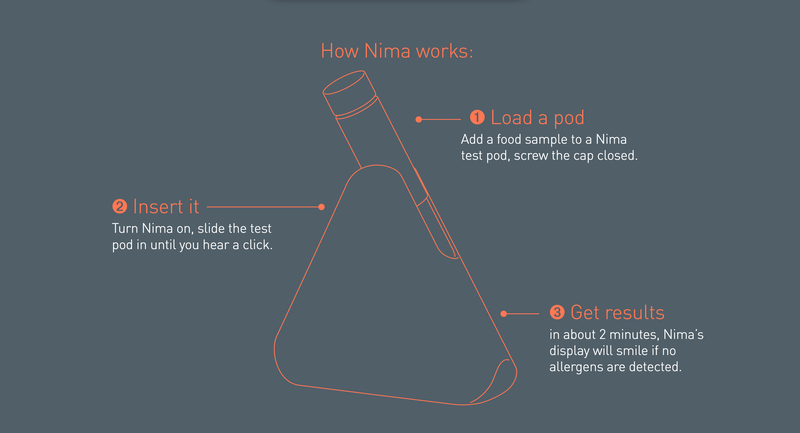 It’s important to note that 6SensorLabs does not need FDA approval for the Nima. The device simply tests for gluten and the company does not make any claims on the impact of a person’s health. 6SensorLab is currently taking pre-orders for the device.